The Falmouth High School boys' basketball team huddles after the first quarter of the Yachtsmen's Class A South quarterfinal matchup against Brunswick High School Saturday night at the Portland Exposition building. The No. 3 Falmouth High School boys’ basketball team survived a test against No. 6 Brunswick High School Saturday night at the Portland Exposition Building, winning 45-31 in the Class A South quarterfinal. The Yachtsmen jumped out to a 17-9 lead after one quarter, but the Dragons roared back to take a 22-21 advantage at halftime. Brunswick’s Finn Mitchell (11 points) and Sam Sharpe (nine) combined to score 20 of the Dragons’ 22 first-half points, according to Jeff Mannix of sports talk radio 96.3FM, The Big Jab. 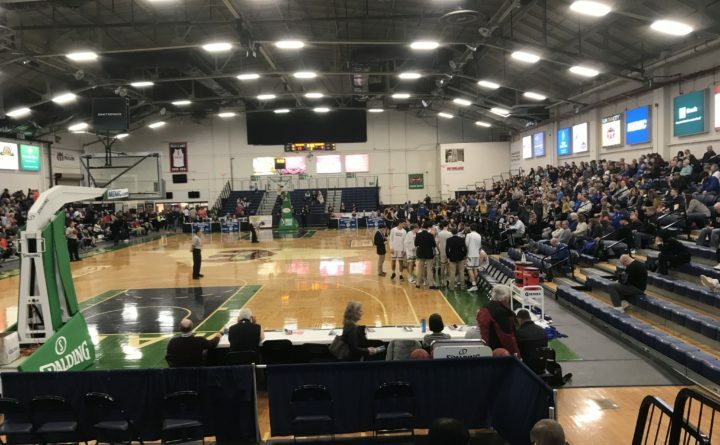 But higher-seeded Falmouth came back, finishing the third quarter on an 11-2 run to take a 34-26 lead heading into the final stanza, according to WMTW television. The Yachtsmen dominated the rest of way to secure the 14-point victory. Michael Simonds scored 21 to lead Falmouth, followed by teammate Nik Hester with 14, according to The Forecaster’s Michael Hoffer. Mitchell finished with 15 to pace Brunswick, he wrote. The Yachtsmen move on to the semifinals Wednesday night at the Cross Insurance Arena in Portland with a 14-5 record, while Brunswick ends its season at 9-10. Falmouth previously defeated the Dragons during the regular season, winning by a 64-36 score on Dec. 14. Falmouth has reached at least the semifinal round now in four straight seasons, narrowly losing to eventual state champion Greely High School in 2018 and topping Cape Elizabeth High School in the 2017 semis to reach the Class A South final. The Yachtsmen won the state title in 2016, defeating Oceanside High School of Rockland by a 59-28 score. Brunswick has been knocked out of the tournament in the quarterfinal round for five straight years.